Make soft pretzels at home! Fresh, warm soft pretzels are one of those treats that are always tempting when you see them on a menu, pass one of those pretzel stands in a mall or see everyone else with their paper wrapped pretzels at fairs and carnivals. Luckily, they are actually pretty easy to make yourself. They key is boiling the dough in a mixture of water and baking soda before you bake it. It's what gives the outside that distinctive brown and slightly crisp crunch. 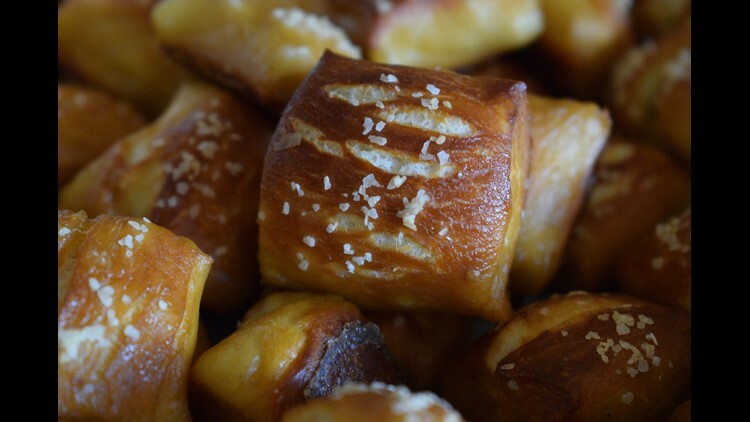 This recipe is for pretzel bites, but you can use the same one for large soft pretzels if you would prefer. Just twist the dough into a pretzel shape after rolling it into ropes instead of cutting into bite-size pieces. Combine water, butter, sugar and yeast in stand mixture. Using dough hook, mix until combined. Let stand for about five minutes. Add salt and flour a mix on low speed until combined. Increase speed and continue mixing until the dough is smooth and pulls away from the bowl. Turn onto a clean surface and knead into a ball. Place ball into a bowl, coated with vegetable oil. Turn dough over until coated with oil. Cover with plastic wrap. Place in a warm spot and let rise for about an hour or until doubled in size. Remove dough from bowl put on clean surface. Divide dough into 4 equal pieces. Roll each piece into a long rope that's about equal in width. Cut ropes into one inch pieces. Meanwhile, bring a large bowl of water to a boil. Carefully, add baking soda. Boil pretzel bites in the baking soda and water for about 30 seconds, working in batches. Remove with a slotted spoon and place on a greased baking sheet. Beat egg with 1 Tbs cold water. Brush each pretzel bite with egg wash and sprinkle with salt. Bake for 15-18 minutes or until golden brown. Serve with mustard or cheese sauce.